Microplastic pollution can float for up to 60 miles. 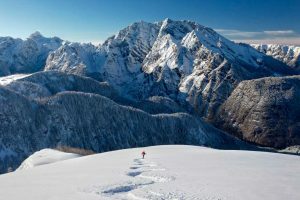 “Microplastic is a new atmospheric pollutant"
We’ve polluted the deepest oceans with plastic garbage, so it’s not surprising we’re also ruining our most pristine mountain peaks. Scientists were able to determine that the microplastic – which is plastic that’s less than five millimeters in length or about the size of a sesame seed – came from at least 60 miles away. According to Science magazine, the tiny particles of microplastic may travel much farther than 60 miles. “Dust particles from the Sahara Desert, for example, have been found in the Pyrenees, even though they are twice as large and twice as heavy as the microplastics found in the study,” Science said.